Forget winged eyeliner and smoky eyes: The new trend is the “no makeup” look. For the past few seasons, bare-faced models have filled the catwalk, and the natural look has trickled down to celebrities on the red carpet. The goal is to amp up natural features without looking like you have loads of makeup on. Follow these tips to perfect a more dewy, rosy you! For a polished look, you need to start with a healthy base. Get glowing with a gentle scrub to remove any dead skin cells. If an exfoliator is too harsh, use a face cleanser then wash off with a damp cloth. Finish with a toner, such as witch hazel, to remove any leftover dirt and tighten pores. Next step: Smooth out your complexion. The fastest and easiest way to achieve a smooth appearance is with a tinted moisturizer that both hydrates and provides slight coverage. A BB (beauty balm) or CC (color correction) cream may supply additional benefits including even skin tone, wrinkle reduction, and SPF (to protect skin from further sun damage). If you prefer foundation, choose a liquid with light coverage and blend it well with a sponge. Prevent skin from looking too matte (natural skin has a more dewy look) by applying powder only on oil-prone areas such as the T-zone and chin. Brush it on in a circular motion to prevent a powdery look. Let’s face it: No one wakes up with a perfect complexion, but thankfully a little makeup can do wonders. Cover any blemishes and dark circles with a concealer about two shades lighter than your skin tone. Don’t cake a thick layer of concealer on blemishes (it could attract more attention to them). Instead dab on a light layer and add more if needed. 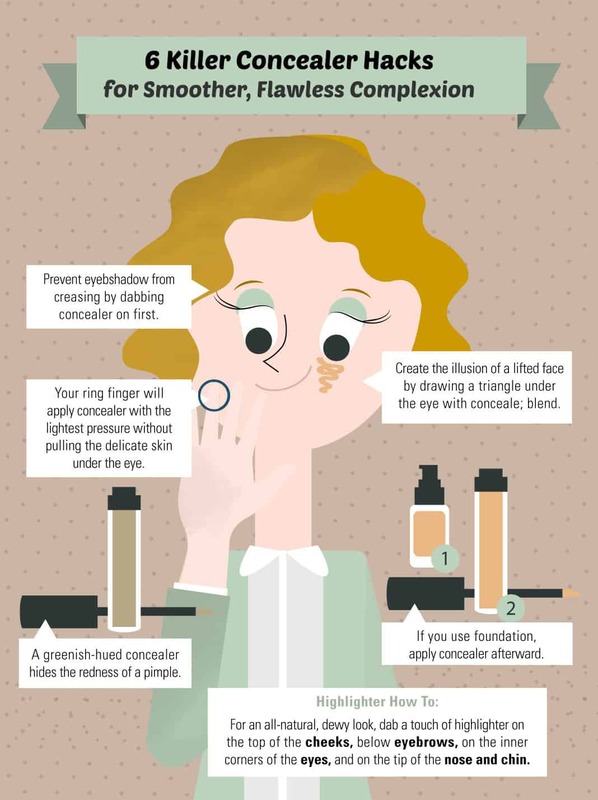 Swipe concealer under the eye and use your ring finger (it gives the lightest pressure) to blend in. Warm up the cheeks with a cream blush. Compared to a powder blush, a cream creates a more subtle flush. Look for warm peaches instead of cool pinks, which can make women look too made up. Use the fingers to dot blush on the apples of the cheeks, then blend upward toward the temples. Finish by dabbing a touch of highlighter on the top of the cheeks, directly below the arch of the eyebrows, and on the tip of the nose and chin for a bright and natural glow. A little makeup can help open up the eyes with minimal effort. Use a champagne or warm gold eye cream on the lids and blend a shimmery white eyeliner in the inner corners of the eyes and along the lower lash line for a well-rested look. Want a little definition? Glide a thin brown or black pencil eyeliner across the top of the lids, but skip the liquid liner. Instead of mascara use a lash tint to enhance and elongate lashes without looking too made up. For smooth, natural lips, exfoliate with a lip scrub or dry toothbrush. Finish with a tinted lip balm that will hydrate and add a touch of color. To save time and reduce the amount of products lurking in your bag, blot a lip stain on both the cheeks and lips for a rosy yet natural look. Thick eyebrows are trending, so if yours are a little on the sparse side, amp up arches with a powder that matches your hair color. Gradually fill in any patches with powder and only use an eyebrow pencil if you need to add some shape (too much pencil can look jarring). Blend with a brow brush, then finish with a brow gel to keep pesky hairs in place. The “no makeup” trend isn’t fading anytime soon, so it’s worth it to start learning now. Master these steps and the au natural look will be a breeze.